Thelma Davies has rewritten the record books in Pennsylvania sprints over the course of the first three years of her career at Girard College. One state record she is yet to grab is the 200 meter indoor mark, set three years ago by Kouri Peace. That record sits at 23.74 from Peace's state meet-winning performance. Davies, who won her second straight indoor state crown in the 200 meters last year, has been knocking on the doorstep of that record. Last year, she ran 23.89 at the early-season Hispanic Games. Outdoors, she shattered the 200 meter state record, running 23.10 at USATF Juniors. Three other returners ran under 25 seconds last indoor season. Saucon Valley's Talitha Diggs took a rather close second to Davies at the state meet. Diggs clocked a 24.23 and also went sub-24 outdoors. Now a junior, expect a monster season out of Diggs. Neumann Goretti's Mykala Perry also ran a best of 24.71 last winter, taking fourth at indoor states. She was second to Davies at outdoor states in AA and will once again be a factor in the one-lapper this season. Mount Lebanon's Molly Mangan ran 24.97 last winter, running that time to take fifth at the indoor state meet from the second of four heats. Mangan should be in line for a good senior season. The other returning medalist from last year's state meet is Arianna Eberly of Coatesville. She ran 25.20 to take eighth at the indoor state meet last year. 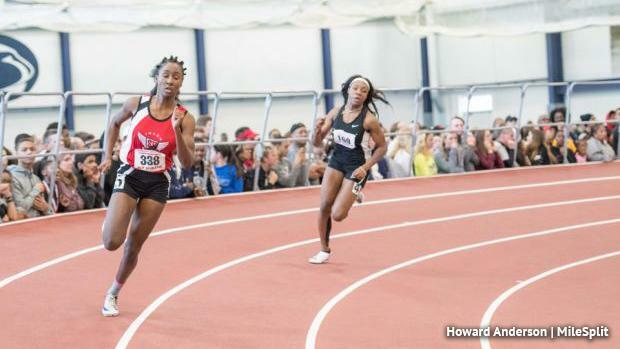 Eberly and her Coatesville teammate Porsha Miles make for arguably the state's best 1-2 punch in the 200 meters. Miles went 25.14 last indoor season. Cheltenham's Bria Barnes, Upper Saint Clair's Jane Madson, Warwick's Leah Graybill, Swenson's Jada Smith, and Abington's Rorie Spencer are among the other top returners in this event to watch for this winter. One to watch is Moforehan Abinusawa, a freshman at Germantown Academy. As an eighth grader last year, she ran 25.17 indoors and 23.56 outdoors. She should be a threat this season. We also can't forget about the aforementioned Kouri Peace of Pennridge. Now a senior, she has battled injuries since her record-setting freshman season. Committed to the University of Florida for soccer, it remains to be seen what Peace's plans are for this winter.